6/4 Cup of Coffee: Unlike Eastern League pitchers, the calendar finally found a way to slow down Xander Bogaerts, as Portland had a day off. However, there was still plenty of baseball on the docket. Pawtucket lost in extra innings, Salem cruised to a sweep in a doubleheader, and the DSL Sox moved to 2-0. Pawtucket could not hold a ninth-inning lead and fell in 11 innings to the Syracuse Chiefs (WAS), 6-5. The loss was even more heartbreaking, as the Chiefs were able to rally against Ryan Rowland-Smith and Chris Martin, the two most dominant relievers in the Red Sox system this year. Alfredo Aceves gave up three home runs but was able to work into the eighth inning and hand off a 5-4 lead to Rowland-Smith. After getting the last out of the eighth, the left-hander allowed a game-tying home run to Corey Brown to lead off the ninth. It was the first long ball that Rowland-Smith has allowed on the season. Martin followed, allowing three consecutive one-out base hits in the 11th, as the Chiefs took the 6-5 lead. Martin was unscored upon in his first 16 appearances of the season, covering 28 1/3 innings, but has allowed a run in each of his last three outings. The PawSox were led at the plate by Mitch Maier. The center fielder went 3 for 6 with a double, a run scored and an RBI. Maier has now hit safely in five straight dating back before his stint on the disabled list. Brock Holt also remained hot, with a 3 for 5 performance. During his 11-game hitting streak, Holt is a phenomenal 21 for 45, good for a .467 batting average. Salem hosted the Winston-Salem Dash (CWS) for a twin-bill due to a May 22 rainout and took the first game by a score of 5-4. Starter Mike McCarthy cruised through the first four innings, shutting down the Dash on only one hit, but ran into trouble in the fifth. Coming into the inning with a 5-0 lead, McCarthy allowed five hits, including a trio of doubles, while only recording one out. With the tying run on second, Salem turned to Noe Ramirez, who was dominant. He immediately induced a 6-3 double play, and that was the last base runner Winston-Salem would get. Ramriez turned in 2 2/3 perfect innings, striking out two, to pick up the win. 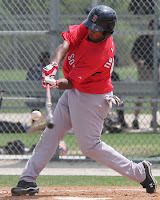 Keury De La Cruz (pictured) sparked the offense, going 2 for 3 and driving in four of the teams five runs. His first-inning triple plated three and gave Salem a lead it would not relinquish. Deven Marrero also went 2 for 3 for the Sox. Garin Cecchini went 0 for 1 but reached base twice with a pair of walks and scored a run. In the nightcap, Salem completed the sweep with a 6-3 victory. Once again, De La Cruz delivered the big hit, an RBI double that scored Cecchini in the fifth, breaking a 3-3 tie, and came home to score an insurance run on a Henry Ramos single. The Dash were unable to retire Cecchini, who went 2 for 2 with a walk and a hit by pitch, scoring two and driving in two. After reaching base six times in seven plate appearances in the doubleheader, Cecchini's OBP is up to .481. Kyle Kraus got the call from Low A to start game two after spending the first two months of the year in the Greenville bullpen. The 2012 seventh-round pick out of the University of Portland was impressive, allowing just one run on four hits in four innings of work, while striking out one and walking three. Madison Younginer surrendered the lead but was credited with the win, allowing a pair of runs on three hits in 1 1/3 innings. Matt Price struck out two in 1 2/3 shutout frames to notch the save. The DSL Red Sox moved to 2-0 on the season with a 9-2 win over the DSL Rays. Signed to a $610,000 bonus last summer, Jose Almonte made his professional debut, and he did not disappoint. The right-hander allowed a run on two hits, striking out four and walking two in five innings to earn the win. A trio of arms held onto the lead, as Enfember Martinez, Jose Espitia, and Daniel Gonzalez combined to allow just one unearned run on one hit. The offense banged out 11 hits, as every starter reached base for the Sox. Raiwinson Lamenda, getting the start in left field, went 2 for 4 with a double, an RBI, and a pair of runs scored. Ricardo Andujar also had a pair of hits, going 2 for 3 with a double and an RBI. Player of the Day: Keury De La Cruz was the key to Salem's sweep in its doubleheader. The right fielder went 4 for 6 with a double and a triple, driving in the go-ahead run in both games. His double in the nightcap moved him into a tie for the lead in the Carolina League with 18, and he is tied with Cecchini with 24 extra-base hits to lead Salem.